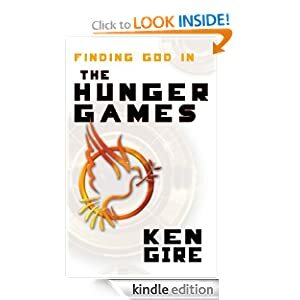 Summary: Mostly Gire does not find God at the hunger games. So when christianaudio.com was offering Finding God in the Hunger games to review I jumped. And since the book is short I listened to it all in an afternoon the same day I requested the review copy. My main problem is that this is a slipshod book. I do not have a problem with the relatively short length (about 85 pages). But the is not really a book about the Hunger Games. It is three essays. One about entertainment and Rome. One about the hunger for God within each of us. And a final chapter about the end times. Not only is Finding God in the Hunger Games not about the real content of the Hunger Games, but the author admits that the few interactions with the Hunger games are mostly from the movie and not the book. That was disappointing, no where in the description does it say that this book is primarily about the movie. He even says he had not finished reading the book before he started watching the movie. This leads to lots of impressions and not much content. There are the occasional quotes, discussing a couple scenes. However, what I was looking for was a discussion of the story, the over arching themes of the book. As the beginning of the third section of this book, Gire essentially says he does not believe that God is in Hunger Games. This indicates to me that if that is the final conclusion, then the author could have written an article or a blog post, stated he conclusion and left it at that. The book just seems like an attempt to take a cultural ways and get people to buy the book. Gire mentions that he has read a number of blog posts about Christian themes in Hunger Games. His conclusion is that he does not really agree with most of the posts, but what he really learned is that people on the internet are mean to one another. This leads into a discussion of entertainment and the internet. But it is a good example of what is wrong with the book. What makes it worse is that I was aware of Julie Clawson’s The Hunger Games and the Gospel. I read a couple of her shorter essays and blog posts as she was preparing the book. Although I have not read the whole book, it is clear from the parts I have read and the reviews of the book, that Clawson was interested in discussing the book, not just talking about occasional themes that were similar to bible stories. Both non-Christians and Christians have reviewed her book and been impressed with her level of scholarship and insight into the book. I saw the movie, have not read the book. But none of that is important. I am – frankly – scandalized that someone of Gire’s reputation would release such a book. Did someone else do that without his permission in order to capitalize on his name? Everyone who bought the book should request a return of their money since the book’s premise is a lie. Or perhaps Gire has had a stroke? Alzheimer’s? dementia? For a book-lover, this is a serious betrayal of trust! After your comment I went and looked at his other books. I haven’t read any of them and don’t know anything about him. But this feels like a commissioned book that he really wasn’t into.